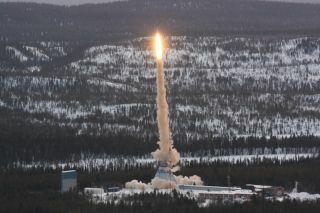 A TEXUS-49 rocket launched from the Esrange Space Center in Kiruna, northern Sweden, carrying plasmid DNA on its exterior. Scientists were surprised to find that the DNA survived the 13-minute flight. The substance that holds the code for life may be able to survive a short ride in space, a new study suggests. Samples of DNA squirted onto the exterior of a TEXUS-49 sounding rocket remained functional following a 13-minute low-orbit flight to space, the study's scientists report. Thiel conducted the experiment along with Oliver Ullrich, a biochemist at the University of Zurich and the University of Magdeburg, Germany. Thiel and Ullrich were not intending to test the survival of DNA during spaceflight. Inside the payload bay of the rocket, the pair had placed an experiment that would examine the effect of gravity on DNA and its ability to function. The flight of the TEXUS-49 rocket, which launched from Esrange Space Center in Kiruna, northern Sweden, included at least 3 minutes in low orbit, where the contents of the rocket experience weightlessness. But during flight preparations, Thiel and Ullrich decided to put some DNA on the exterior of the rocket as well: around the outside of the payload, in the grooves of the screw heads, and underneath the payload. Their intention was to test the robustness of a biomarker in the DNA – a specific portion of the DNA strand that contains instructions for a specific function. When the rocket returned, the researchers found at least a small amount of DNA in all three locations — up to 53 percent in the grooves of the screw heads. And as much as a third of the DNA was still functional, according to the researchers. The DNA used in the experiment was not chromosomal DNA — the kind found in humans and most living organisms, which passes on the organisms' genetic information to new cells and to offspring — but rather plasmid DNA, which is found in some bacteria and operates slightly differently than chromosomal DNA. Plasmid DNA is around 10 times smaller than bacterial chromosomal DNA, according to Ullrich. "We cannot say how these big chromosomal DNA molecules would react under the same conditions and this should be investigated in a separate experiment," Ullrich told Space.com in an email. "However, we speculate that small plasmid DNA molecules might be more resistant to re-entry conditions than chromosomal DNA, which is also packed with proteins." The interior of the payload bay reached a peak temperature of 266 degrees Fahrenheit (130 degrees Celsius) and external gas temperatures reached 1,832 degrees F (1,000 C). However, Ullrich notes that the scientists do not know how hot the DNA samples became. In addition, Ullrich says they can only speculate about what factors influenced the survival of the samples. "In general, we think that survival of microorganisms or of 'molecules of life' during re-entry requires a combination of different favorable and 'protective' factors (e.g., protection by minerals, dryness, certain temperatures) and may be therefore not the 'rule', but more a probable, but seldom case," Ullrich said in an email. "But – nevertheless – DNA survival is possible, as demonstrated in our experiment." Other experiments have investigated the robustness of life in space. Scientists have subjected dozens of bacteria and other small organisms to simulated or real exposure to the harsh conditions of the cosmos (outside the protection of a space capsule). Scientists have identified a handful of organisms, called "extremophiles," which can survive conditions that would kill most living things: bitter cold, scorching heat and pounding radiation. Tardigrades, also known as water bears, have surprised scientists with their ability to survive, naked, in outer space. This area of research brings up questions about whether or not life can naturally spread from planet to planet via comets and other space rocks, or rockets. But the new study alone does not suggest that life or even DNA could survive a long trip through space, and Ullrich cautions against overstating its implications. "It is only a very, very small step for a very big question." The study's results appear in today's (Nov. 26) issue of PLOS ONE.